This entry was posted on February 6, 2015 by admin. He's only 3 years old, but Landon Riddle is already the focus of a medical marijuana fight in Colorado. Landon has acute lymphocytic leukemia, or ALL, a cancer of the blood and bone marrow. It's the most common cancer in children. His mother says his condition has improved so much following treatment with medical marijuana that chemotherapy isn't needed. But the Children's Hospital of Colorado, she says, disagreed. 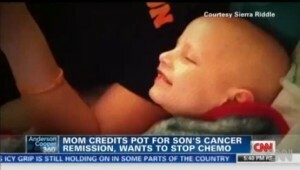 School stops giving boy medical pot Is medical marijuana right for a 3-year-old? "Please don't let my daughter die"
"They thought it was either a virus or infection in the lymph nodes, so they gave him some antibiotics," Sierra Riddle says. Landon was flown to a children's hospital in Salt Lake City. "His whole chest was full of leukemia tumors, which is why he couldn't breathe," his mother says. "They started him on chemo, but told us that he probably wasn't going to make it." Landon's cancer had quickly progressed, leading doctors to give him an 8% chance of survival, she says. "Most days he couldn't get off the couch," Riddle remembers. "He would just lay there and throw up and throw up." Riddle says he also developed neuropathy -- a symptom of nerve damage that can cause weakness, numbness and pain -- in his legs that left him barely able to walk. Around that time, a friend set up a Facebook page called Offer Hope for Landon, and recommendations started streaming in, including several endorsing cannabis -- medical marijuana -- as a treatment. Medical marijuana, however, isn't legal in Utah. Still, desperate for answers, Sierra Riddle and her mother, Wendy Riddle, started looking into it. They considered going to California or Oregon. Then their research led them to the Stanley brothers in Colorado. The six brothers are one of that state's biggest cannabis growers and dispensary owners. The Stanleys produce about 500 pounds of medical marijuana a year. At the time, much of it was high in THC -- tetrahydrocannabinol, the psychoactive ingredient in pot that gets users high but also helps patients with an array of conditions including pain and nausea. But the Stanleys were also growing something quite revolutionary: a plant cross-bred to reduce the THC and increase another compound found in cannabis called cannabidiol, or CBD. Many researchers believe CBD is one of the compounds in marijuana that has medicinal benefits. According to the National Cancer Institute, it's thought to have significant analgesic, anti-inflammatory and anti-tumor activity without the psychoactive effect. "I was telling my mom, you know, 'We really need to think about this.'" But, says Riddle, her son was already prescribed medications like OxyContin and morphine -- medications with significant side effects. Landon suffered from stomach failure, and "the OxyContin made him so miserable, when he had hair, he would literally try to pull his hair out." In the end, she decided she had nothing else to lose and moved to Colorado. She rented a room, got Landon's medical marijuana card and began giving him marijuana -- THC for the pain and nausea, but also CBD. The dose was based on Landon's weight. He first took it in oil form, but now takes a pill. Once the doses started, "Landon's (red and white blood cell) counts increased dramatically," she says. Six months later, encouraged by Landon's progress, she stopped his chemotherapy treatments completely. "Once I took the chemo out, I see these amazing results. And no more need for blood transfusion and platelet transfusions," Riddle says. "I think that the chemo in combination with the cannabis did put him into remission and now the cannabis will keep him there."